The lows are in the 50s this week in Memphis and so fall recipes are on my brain. This one serves six to eight by itself. If you serve with a frittata or breakfast casserole, much more. Preheat oven to 350F. Grease a 2 1/2 – 3 qt. casserole dish. Combine the dry ingredients in a large bowl. In a separate bowl, whisk the wet ingredients until smooth and add to dry ingredients, stirring to combine. Pour into dish and bake covered for about 45 minutes (until a toothpick or knife comes out clean.) Serve with milk and/or yogurt. This is a quick iPhone shot. I have yet to master food photography while serving. Food is for eating, after all! I know this will sound strange, but is there another spice you can substitute for cinamon? I have an allergy but this sounds absolutely delicious! N.B. 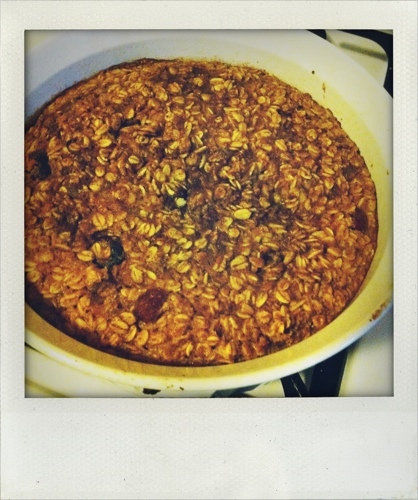 If you’ve never tried baked oatmeal the consistency is quite different, like a chewy soft granola bread. You can experiment with adding milk and yogurt which changes things as well. Oooh, yes please. Halloween themed food is my favorite! this sounds right up my alley. Gonna try it.